The AmDTuning.com with Cobra Exhausts team secured a brace of points finishes from what proved to be a challenging weekend as the Dunlop MSA British Touring Car Championship burst back into life at Snetterton. The West Thurrock-based team headed to Norfolk buoyed by a strong showing at Croft prior to the summer break and with confidence high of fighting for more top 15 finishes. Fresh from three points finish in North Yorkshire, Tamworth-based Ollie Jackson qualified 17th on the grid at the wheel of his Audi S3 and looked well set to score again as he quickly fought his way into the points in the opening race. However, Ollie would then find himself on the receiving end of contact on multiple occasions as the Audi was roughed back to the lower fringes of the top 20; with the 33-year-old left to wonder what might have been as he brought his damaged car to the finish in 18th place. Ollie picked up points in race two with a solid run to 14th spot but any hope of pushing further towards the top ten were ended on the opening lap of race three when he was taken off at Oggies by an out-of-control rival. “There is no doubt that we had a car that was capable of the top ten this weekend and it’s only because of stupid driving from other people that we’ve not been able to get some really good points,” he said. “The car was better than it was at Croft and I think that was reflected by the improved performance in qualifying, even if we should have been higher on the grid than we were. “In race one, we got a good start and were well placed to score but then all of a sudden, I seemed to acquire a target on my car and I was being hit from all angles. We picked up some points in race two but then again in race three, I was minding my own business and then someone smashes into me and I’m out of the race through no fault of my own. Team-mate Ant Whorton-Eales was also keen to push for points at the longest circuit on the calendar and qualified in a fine 15th place for the opening race of the weekend. Like Ollie, the reigning Clio Cup UK champion found himself in the heart of the action in the opening race of the weekend – with contact on more than one occasion meaning he ultimately finished the race down in 20th spot. 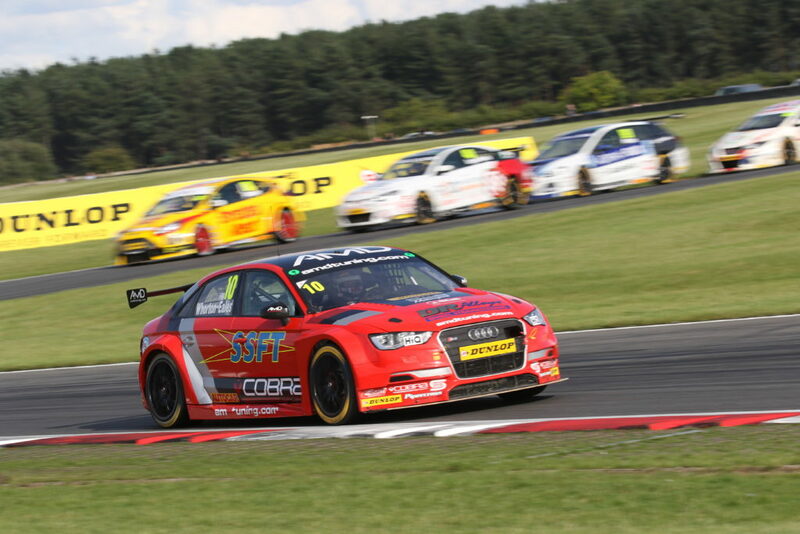 Having finished race two in 21st, the team made a series of changes to Ant’s Audi ahead of the final race of the weekend and the Lichfield racer took full advantage with a strong drive that saw him battle his way up to eleventh place; matching his best result in the series to date. “On the soft tyre in race one I felt we needed to push early on to make up places but the problem was that I kept getting forced out wide and it cost me places,” he said. “As it was, the soft tyre actually turned out to be the better tyre this weekend because in race two when I thought we’d be able to make progress on the normal tyre, we struggled to make our way through the field. “Before the final race we made a lot of changes to the car and it was a lot better. We took a real step in the right direction and the changes really improved the car so I could fight forwards into the points. The pleasing thing was discovering afterwards that we’d been racing door-to-door with guys who were on the soft tyre, which should have been quicker, and we proved to be more than a match for them. Team boss Shaun Hollamby admitted it had been a weekend where both drivers deserved more than the results they had picked up from the three races. “Both drivers have driven well this weekend, certainly better than the results on paper show, and there is nothing that they could have done to avoid being caught up in other peoples incidents,” he said. “There’s a lot of hard work that has gone into the cars and we have to just keep plugging away at it and not let what has happened here get us down.